The story, for what it is, feels more like a collection of cyberpunk words and mild philosophy that you have to click through occasionally to get to the game again. There’s a number of factions competing from control over the city, and as an exclusive mercenary team, you can shape the future. But the uninteresting characters and annoying mechanics made it redundant in the face of the overwhelmingly positive multiplayer. Frozen Synapse 2 is a near perfect game if you think of it as nothing but a multiplayer game with a single player tutorial. Adding one from the series original with new soldier types, several tweaks and more game modes, this is a title for anyone that loves incredibly tense, slow paced action games. I would call it chess with guns, but it’s better than that. Each player controls a small team of soldiers in a randomly generated map. Generally, the objective is to kill the enemy team, and you do this by meticulously planning each five second move. It’s up to you to micromanage every part of your turn, from where the soldiers are aiming to what they will do when they spot an enemy to exactly where you want them to move. Once you’ve registered all that, you prime your turn, and so does your opponent. From there, both your moves and your opponents happen simultaneously. You have to anticipate your enemies options, weighing up countermoves and double bluffs to try and overcome the odds. And all of it is incredibly easy to control. Simple instructions with easily understood outcomes means you can be confident of what you’re doing even with hugely complex instructions. On top of that, you can test all your decisions before priming as well, Frozen Synapse even lets you put in orders for the other team so you can try your plan against what you think they might do. Patience is a virtue here for players determined to win. Shoring up your strategy against dozens of potential countermoves is the safest course of action, but you can never be one hundred percent sure what your enemy is planning. Different modes can affect the game as well. Some show you exactly where the other team is at all times, some only when your units have visual contact. One game had my shotgunner walk straight past an opponent because neither of us had spotted the other, which lead to a surprise encounter a few turns later when I thought that the corridor was safe. Some games lend themselves to emergent game types, where one team might spawn inside a structure and immediately take the defensive, with the other team quickly rushing to secure footholds or scouting out potential weak spots. The downside to all of this is, of course, the waiting part. Like chess, you can play one turn before wandering away to do something else, which is nice when you’re busy, but the other players can do the same. It can be almost overwhelming to impotently wait to see the outcome of a decisive turn if the other player isn’t around. But with a large community and easy matchmaking, playing a different game can be the best distraction. Graphically, Frozen Synapse 2 is nothing much to write home about. It’s a serviceable homage to retro-futurism, with buzzing bright colours and jagged shapes. But it gets all the information across that it needs to in a simple, instantly understandable way. The music is well matched too. Never intruding on your thoughts, but never boring your ears either. I tried to listen to a podcast one session but found myself not paying attention to a single word as I perfectly executed an elaborate plan that immediately blew up in my face. Even losing in Frozen Synapse 2 is rewarding. Once the game is completed you can watch it all through seeing your opponents every move and learning where they caught you. Even before the game ends, the dynamic shift where you go from equal footing to one or two units left is a thrilling, nervous moment. 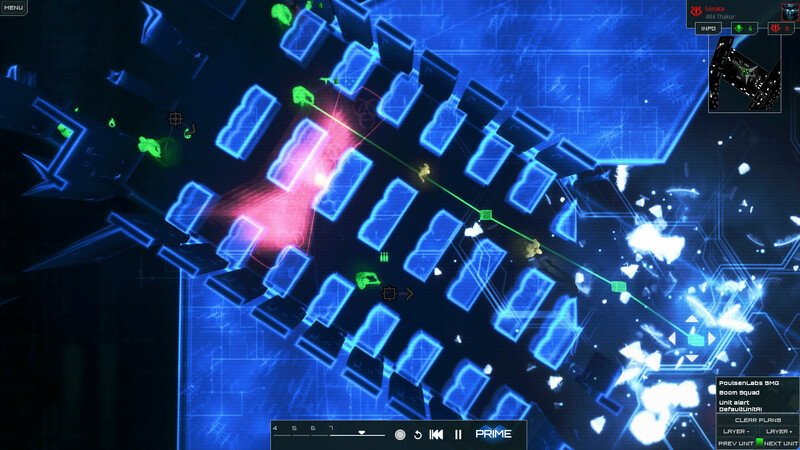 Thrilling is by far the best way to describe Frozen Synapse 2. Once you remove the humdrum single player campaign, what remains is permanently refreshing, exciting and strategic. It’s easy to lose a lot of time to the micromanagement part of Frozen Synapse 2, but it is completely worth it when a plan comes together, and just as thrilling when it doesn’t. Review code provided by the publisher. You can purchase the game via Green Man Gaming. Frozen Synapse 2 effectively builds onto the first game with new weapons and a deeper sense of action and anticipation. The single player is unfortunately tepid compared the multiplayer, but the game is nevertheless an essential strategy addition.